Clubbell Yoga: Action Potential provides the exact formula that is used in workshops, seminars and group classes. Awaken, Condition, Practice. This signature method will completely transform your ability to find Flow, ramp up your functional fitness while getting leaner, stronger and more durable. Meaningful movement has never been more accessible than it is in this easy to follow program. 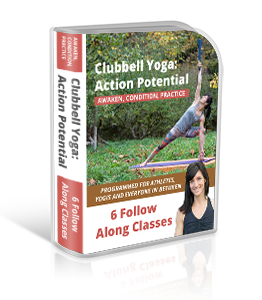 Clubbell Yoga: Action Potential is comprised of 6 full length follow along classes each with a focus on one or more of the 7 zones of mechanical advantage in the body. When you practice all six classes in order, you will bring balance to your entire system on both the musculoskeletal level and the more subtle energetic levels. Breathwork and somatic training are key elements of the coaching cues in Clubbell Yoga: Action Potential, and are taught from a non-dogmatic viewpoint. Athletes attending a yoga class may not be able to access the poses due to chronically shortened muscles, while yogis steer clear of strength and conditioning work because it detracts from their flexibility. Both yogis and athletes needed dynamic mobility training with a purpose, instead of randomized workouts or flows. Clubbell Yoga: Action Potential bridges the gap between strength and yoga by providing a full length class with elements of both yoga based conditioning and yoga flows. People who struggled with finding coordination to flow in traditional yoga classes praise Clubbell Yoga: Action Potential for taking them step by step through the process of building both FlowStateofMind and Flow level of breath. Clubbell Yoga: Action Potential is for everyone who wants to improve their yoga, fitness, athleticism, breathe and somatic awareness.